" 'Green News Report' - January 29, 2019	"
While it may not seem to make sense at first glance, scientifically it's consistent with the extremes expected from climate change. Ecologists and conservationists are bracing for lasting damage on the nation’s public lands and wild places – herons poached from Florida’s Everglades, felled desert succulents that would take decades to regrow, defaced relics from rocky outcroppings in the West. “What’s happened to our park in the last 34 days is irreparable for the next 200 to 300 years,” Curt Sauer, a former superintendent of the park, said during a rally over the weekend. « PREVIOUS STORY "Heads Up! GOP Election Power-Grab Underway in FL In Advance of 2020! 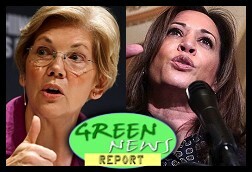 : 'BradCast' 1/28/2019"
"'Green News Report' - January 29, 2019"